Home 602 is a Luxurious, 5-bedroom,3 bathroom, two story home with its own private screened Pool. The home is beautifully decorated throughout, with the main floor fully tiled boasting an airy feel to the whole home. This home is located on 'Lake Davenport Estates' a very peaceful community situated approximately 15 minutes from Walt Disney World entrance and is conveniently located for other attractions. There are ample restaurants and shops for your convenience located on the Hwy27 & Hwy192. 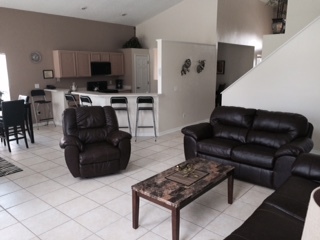 The Palms vacation rental community backs up to Polk County recreation area that has walking trails, football and soccer fields, tennis courts, basket ball courts, pick nick areas, playgrounds and boat ramp to Lake Davenport. The recreation area is top of the line with artificial turf on the fields and beautifully maintained. Grocery shopping is only a half mile away at Publix as well as numerous restaurants and other shops. A Super Walmart is only 2 mile and a Super Taget is on you way to the theme parks. There are too many shops and restaurants to mention that are all convenient to this community, either on the way to the attractions or just a short drive in either direction on highway 27. The Palms Vacation Rentals in “The Palms” are spacious. 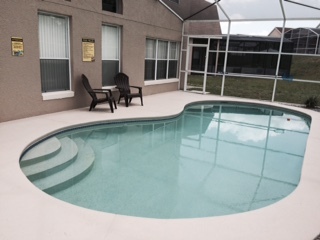 They are ideally situated to be close to Walt Disney World as well as all the Orlando attraction. You may even get to see some hot air balloons float by in the morning over the home you chose which is a nice treat and great for memorable pictures. 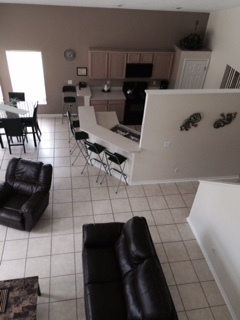 Renting a Disney Vacation Home in “The Palms” is a good choice for value and location. 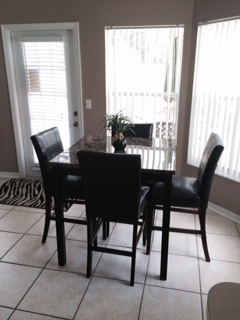 The Palms is a favorite for groups needing multiple homes, and we are able to offer two identical homes for rent should you need to be close with other party members but still have your own space. Definitely consider The Palms as your home base for your Disney Vacation. You’ll want to come back again and again. This home is a home away from home. This 5 Bedroom pool home sleeps 10 people comfortably with two King Size Beds, One Queen Size Bed, and 4 Twin Beds, two in each room. Beautifully tiled throughout on the main floor the Master bathroom features a Large Tub, double sinks and a large walk in shower and walk in wardrobe. There is a further full bathroom on the main floor and one located on the first floor. The home has updated appliances including washer & dryer. The Beds and linens have been updated. 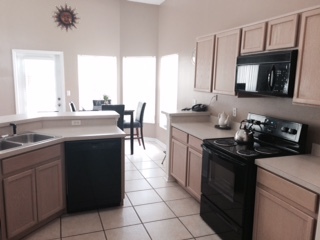 The Kitchen is fully equipped with everything you need to accommodate up to ten people. This home is the perfect location close to all the tourist attractions but still a little bit a way from the hustle and bustle to relax. This is a non-smoking and pet- free home. The owner of this property may refuse any booking without reason. 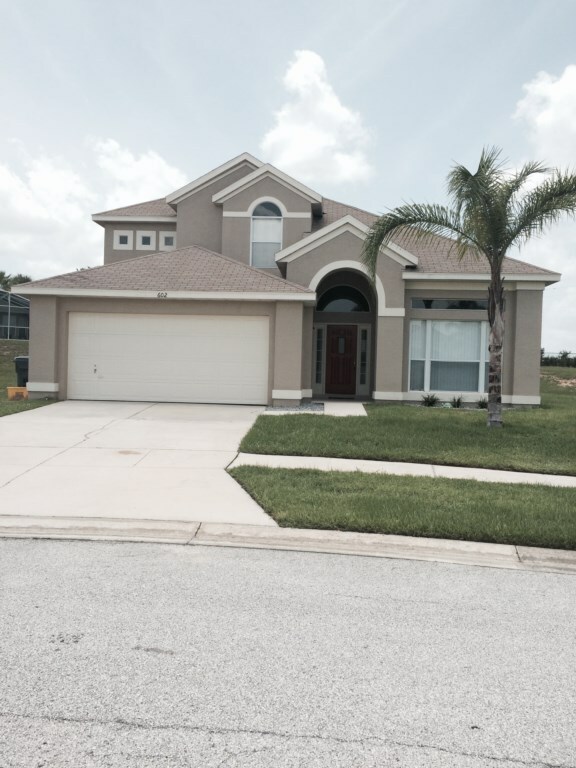 Located eight miles from Disney, Lake Davenport Estates is a secure and safe community of privite homes.The recreational area offers guests tennis courts, basketball courts, playground and a community swimming pool. This home is ideally located for shopping and restaurants to suite all appetites and fashion. Thank you very much for services rendered to the income of the villa. The truth was very satisfied and filled all my expectations have rented the villa with you. I congratulate you on the service you provide, very professional and always maintain communication with client.